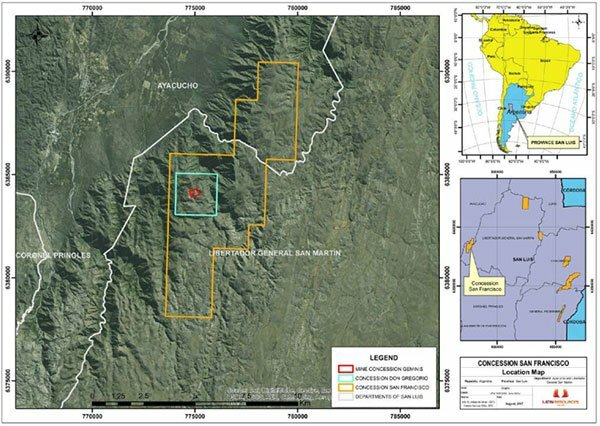 Latin Resources Limited (ASX: LRS) announced on Thursday that it had acquired the Geminis Lithium Mine and Don Gregorio concessions in the western part of the Libertador del San Martin region of San Luis, Argentina through the signing of a Binding Letter of Intent (LOI). The Geminis mine has been historically linked to lithium mining in San Luis and the presence of high grade lithium bearing pegmatites has been acknowledged. 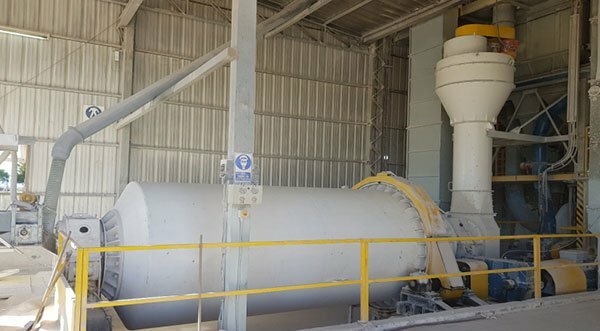 Of particular significance is the established processing facilities in San Luis as this presents a unique opportunity for LRS to fast track production of spodumene concentrate. Historically, the mine was recognized by geologists from the National Development Bank whose work has been reflected in unpublished reports as one of the main lithium deposits in the province of San Luis with lithium ore produced in the period between 1960 and 1980. Commenting on the strategic benefits of this development, Managing Director of LRS, Chris Gale said, “The acquisition of the Geminis mine is further building Latin Resources’ strategy of controlling all of the known hard rock lithium pegmatites in Argentina, and our goal for this project is to produce a JORC resource while designing and permitting a spodumene plant to add to an existing operation in San Luis”. Gale noted the additional benefits of securing a known lithium deposit in San Luis province that has had decades of mineral production, has the potential to transition LRS from explorer to producer in a relatively short time frame. Of course it is early stages for LRS in this endeavour and investors should seek professional financial advice if considering this stock for their portfolio. To this end, a meeting was recently held with the San Luis Mines Department to determine the permitting of a spodumene circuit into an existing operational plant. 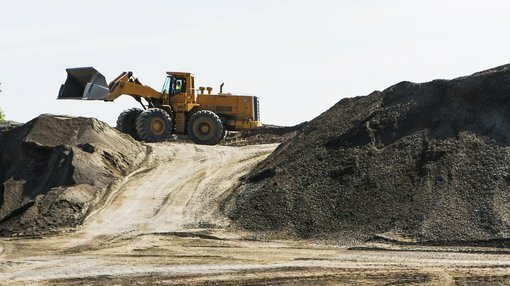 The mining authorities suggested that it would be a matter of “only a number of months” to have a spodumene production circuit approved into an existing operating plant. This would dispense with the normal lengthy process of gaining approvals when constructing a new plant. The Geminis Mine (12 hectares) and surrounding Don Gregorio (388 hectares) exploration concessions are located approximately 8 kilometres to the south east of the village of San Francisco del Monte de Ore and 18 kilometres to the north of the historical gold mining centre of La Carolina in the Sierra Grande de San Luis mountain range. LRS’s San Francisco exploration concession completely surrounds the Geminis and Don Gregorio concessions as indicated below. There are two possible access routes to the mine, one of which is the original access track by which ore was transported from the Geminis mine to the south to reach the main road to the La Toma processing facilities. San Luis Province has an established small mining industry that actively produces quartz and feldspar from hundreds of small mines for the glass and ceramics industry. There are around 100 miners in all, of which the top 5 might produce nearly 75% of the total minerals. The pegmatites located at the Geminis mine are of the complex spodumene type. A broad range of economic minerals are present, and significantly there is intense spodumene mineralisation with parts of the mine comprising up to 80% of the material. In the course of previous mining activities, individual spodumene crystals were measured to have a length of up to 4 metres. Other minerals which are significant and may contribute to the overall value are the lithium minerals amblygonite and lithiophilite, found within the pegmatite’s non-nucleus zones as are other minerals tantalite, columbite and beryl. These non-lithium minerals being present is significant as they can contribute as credits in the production of spodumene concentrate. Following inspection of the central and southern adits. 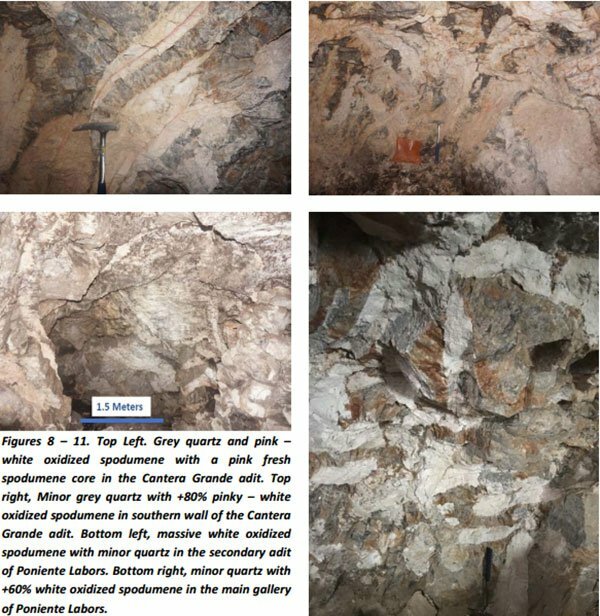 LRS noted that each adit, and the mine workings contained within, have exposed walls that contain extremely high percentages of oxidised spodumene as illustrated below. Gale highlighted the fact that these exposures are by some distance the best spodumene mineralisation seen by Latin technical staff in Argentina. First pass assay results from Ancasti lithium project.